Dyfi Distillery01654 761551work DistilleryDyfi Distillery produces artisan gins crafted with wild Welsh botanicals foraged in the Dyfi Biosphere. Based at Corris Craft Centre, near Machynlleth and this locally produced gin has been recognised in the Great British Food Awards 2017 for the best gin produced in the UK. The prestigious award is for its Pollination Gin, which the judges described as “seriously beautiful”. Dyfi Distillery is one of nine studios at the Corris Craft Centre, run by brothers Pete and Danny Cameron. They established the first commercial gin distillery in Mid Wales in 2016. Pete has lived, worked and foraged in the Dyfi Valley for 35 years, while Danny is a long-standing drinks industry professional and international-standard judge. 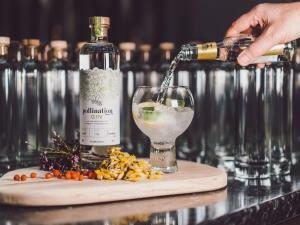 Pollination Gin is one of the few gins in the world produced from mostly foraged botanical ingredients. In this distillery’s case, the ingredients are gathered within the Dyfi Valley UNESCO World Biosphere Reserve. Dyfi Distillery has already won The Independent’s IndyBest Award for the Best New Gin in 2017 for its Hibernation Gin and no less than seven medals at this year’s International Wine and Spirit Competition. The gin is distilled in very small batches, using two small 100-litre stills and the brothers have developed and adapted techniques which allow for maximum control over maceration temperatures, variable copper contact for distillation and much more besides. The stills can move from maceration- to distillation-temperature in an incredibly short time, which also contributes to optimum extraction of essential oils. A distillation run is in part determined by the foraging basket - the result is a Welsh Gin like nothing else: just as it should be. Dyfi Distillery produces artisan gins crafted with wild Welsh botanicals foraged in the Dyfi Biosphere.